New Orleans, Louisiana. 1975. Mardi Gras. New Orleans, Louisiana. 1977. Mardi Gras. French Quarter. 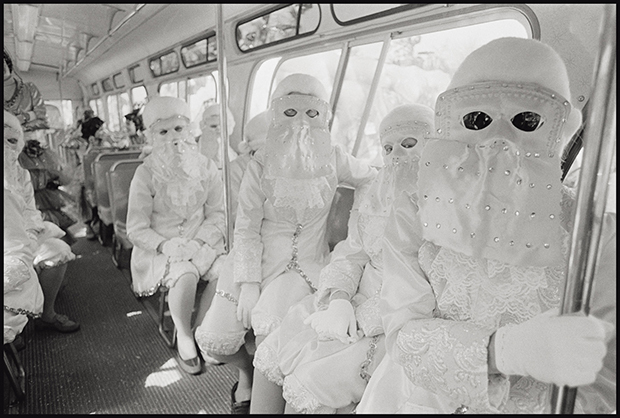 At Mardi Gras in New Orleans, says New York-based photographer Bruce Gilden, the streets become “packed like sardines.” Asking him to name the single most memorable moment from his time shooting the parades from 1974 until 1982 is difficult; there were just too many of them. 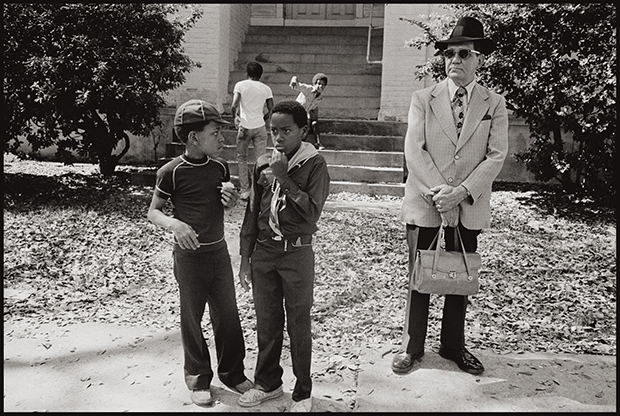 The now-iconic photographer was only 27 years old when he made his first trip to New Orleans. He would spent subsequent trips lodging in the red-light district, or spending nights in his van, depending on the year. 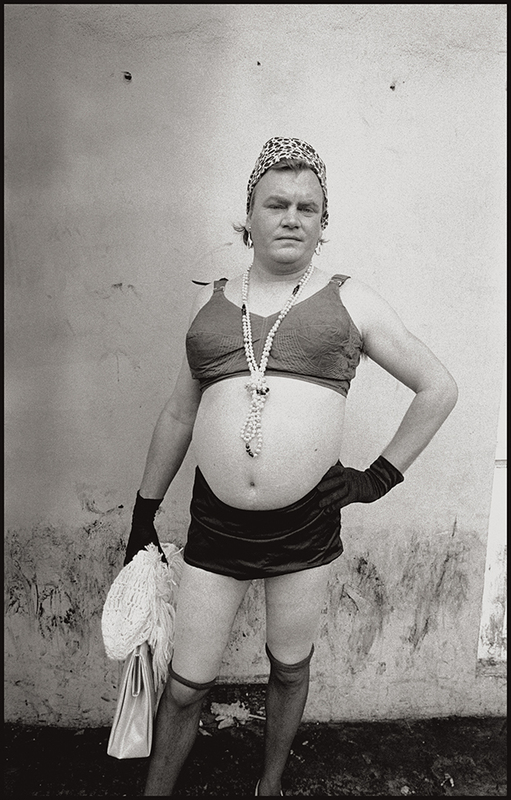 He spent some nights listening to the Eagles on the jukebox with cross-dressers before heading to bed, waking to the bustling streets once more. 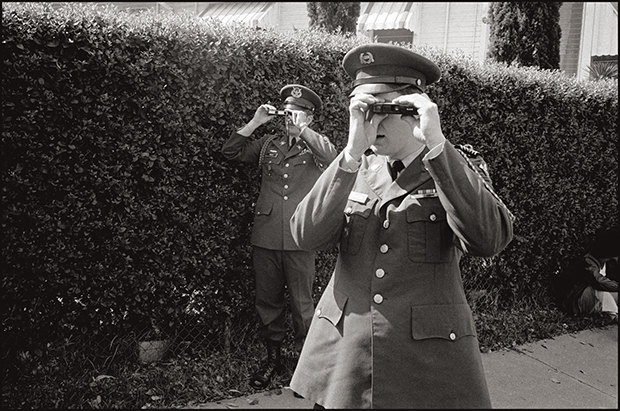 Throughout it all, he had his flash, kept close at hand in the pocket of his army jacket. 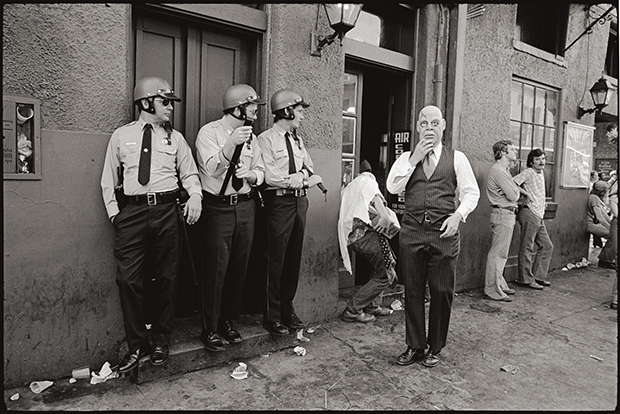 In New Orleans, the tried and true New Yorker couldn’t help but notice the subtle and overt symptoms of racial tensions; he isn’t a political man, but he is a sensitive and keen photographer, capable of picking up on whatever bubbles beneath the surface of what others might see as an ordinary street scene. 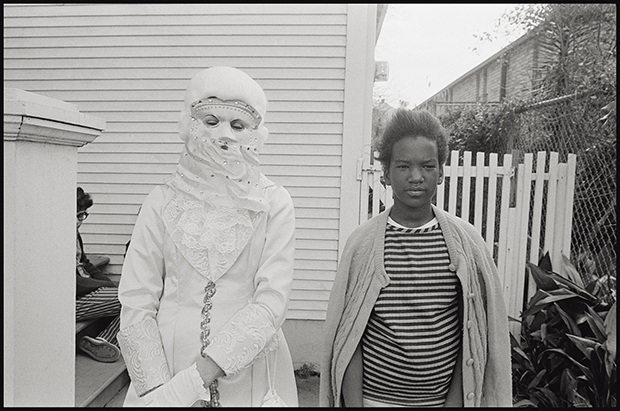 The image of a white girl in a white mask, standing beside her African American double, has stayed with him throughout the decades. 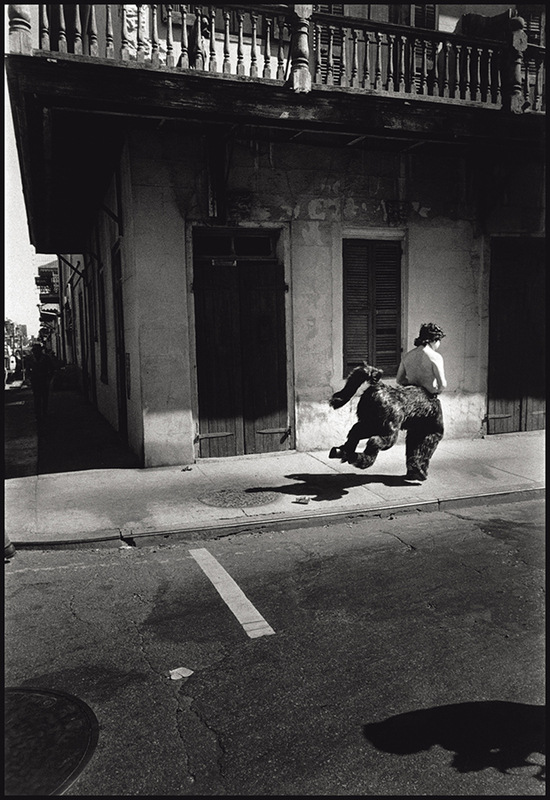 Looking back on the pictures he made in New Orleans, Gilden notes that perhaps he gave his subjects too much breathing room. 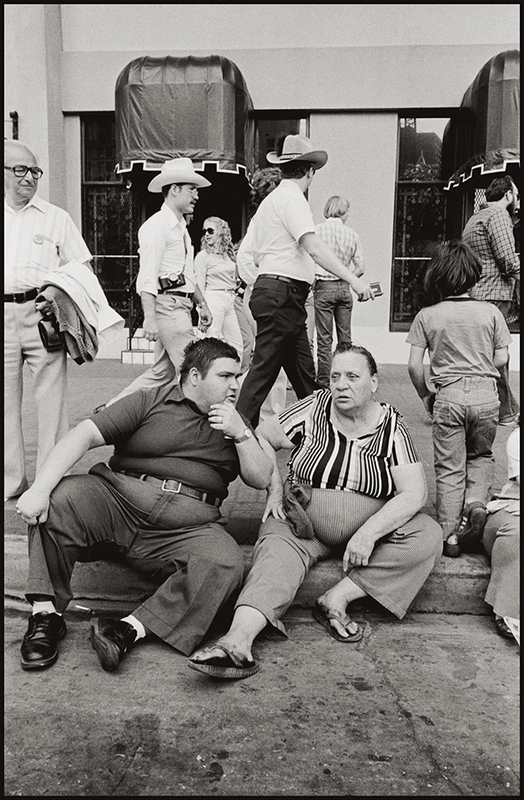 He was young yet, and for a photographer who is famously quoted as saying, “The older I get, the closer I get,” it makes sense that he wasn’t quite as near to his subjects. But perhaps the distance was perfect for New Orleans, a place that moved not as New York does but more slowly. Hey Mister, Throw Me Some Beads is available here. New Orleans, Louisiana. 1982. Mardi Gras. Coneheads. New Orleans, Louisiana. 1982. Mardi Gras. New Orleans, Louisiana. 1976. Mardi Gras. New Orleans, Louisiana. 1977. Mardi Gras. Police and masked man in the French Quarter. New Orleans, Louisiana. 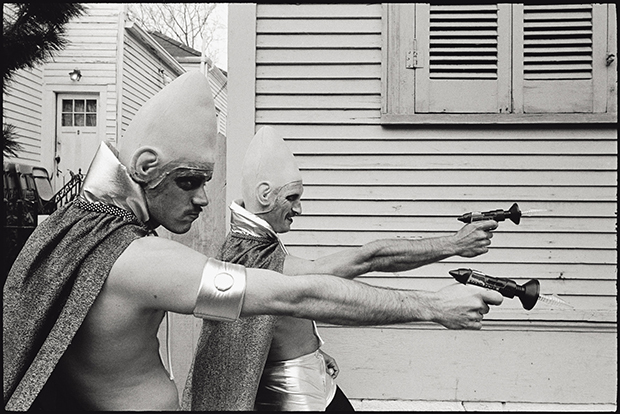 1975. 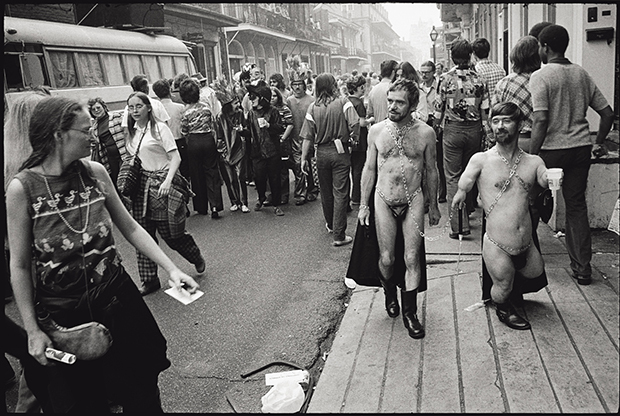 French Quarter, leather chaps seen from behind. New Orleans, Louisiana. 1977. 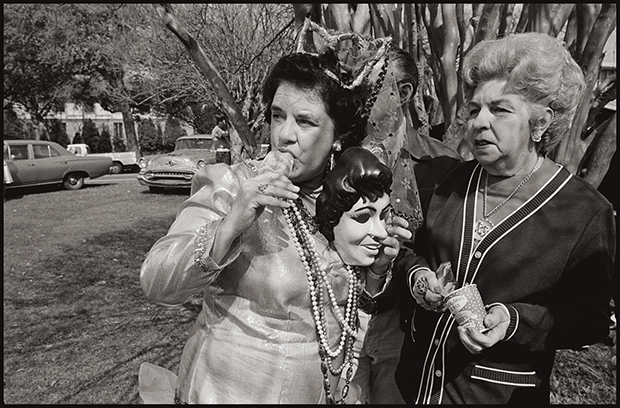 Mardi Gras.